Nicholas Schlegel Interviewed on The Projection Booth | That's a Wrap! Our very own Nicholas Schlegel was honored to join Mike White and Rob St. Mary over at their amazing (you need to be listening!) podcast The Projection Booth. The episode is streaming and ready for download at their website, at iTunes and Stitcher. Nick broadly discusses the Spanish horror boom experienced in Spain from roughly around 1968-77 (the boom years for production). Later, they discuss the very brilliant Narciso Ibáñez Serrador’s ¿Quién puede matar a un niño? (AKA Who Can Kill A Child?) and its 2012 remake Come Out and Play. 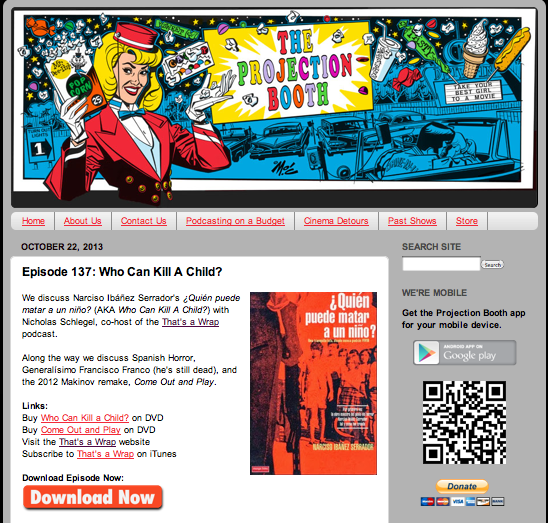 We invite you to listen and subscribe to our good friends at The Projection Booth (clearly one of the greatest cinema-based podcasts on the planet). In fact, That’s a Wrap and The Projection Booth are joining forces for an upcoming podcast “Roundtable” on the state of cinema and WHY FILM MATTERS. Coming soon!